We have a number of products available for clients and health care professionals including books, online courses, recommended courses and on premises training. Exercise for Better Bones — Exercise for Better Bones is for those of you with osteoporosis, osteopenia, or low bone density and want a safe and effective exercise program to improve your bone health, reduce your fracture risk, maintain your independence and improve your confidence. I have designed osteoporosis exercise programs that incorporate weight bearing, cardio, flexibility, balance, and posture improvement. I also cover exercises you should avoid. The book offers four program levels: Beginner, Active, Athletic and Elite. Exercise schedules are available online for you to follow your program. Strengthen Your Core — Strengthen Your Core for my clients who want to improve their core strength.The book covers the theory behind core strength and provides detailed descriptions of each of the Plank and Side Plank poses for all client levels—from beginners just starting to build core strength to advanced elite athletes wanting to gain that competitive edge. Core exercises are organized by level—Beginner, Active, Athletic, and Elite. Over 70 Plank and Side Plank poses are described (with photo illustrations). Yoga for Better Bones —Yoga for Better Bones shows you how to practice Yoga safely if you have osteoporosis or low bone density. Richly illustrated with clear photo images demonstrating modifications to popular Yoga poses. Detailed and clear explanations of why you need to modify your Yoga practice if you have low bone density or osteoporosis. Ideal for individual Yoga practitioners and Yoga teachers. 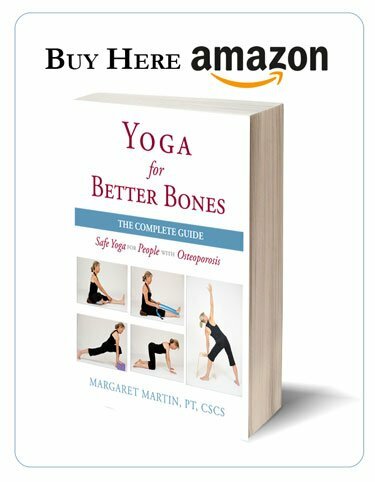 This book shows you how to practice Yoga with confidence and reduce your risk of fracture from osteoporosis. 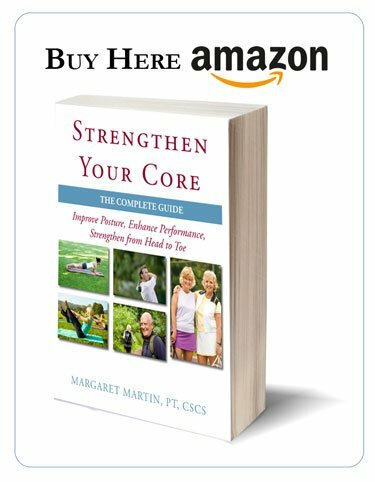 Clients and readers of this site frequently ask my to suggest or recommend products that they should use in their Exercise for Better Bones program and their activities of daily living to strengthen their bones, improve their balance and relieve pain. I put together this list of Recommended Products — many of them I have used with my own clients. I like to share my learnings and experiences with fellow Physical Therapists through both online courses, workshops, and in-services. 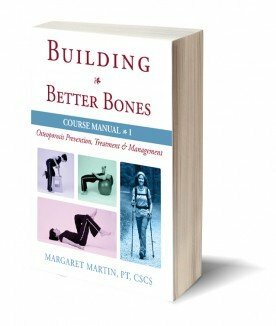 My online course, Building Better Bones (renamed Working with Osteoporosis and Osteopenia), is available through my training partner, MedBridge Education. You can learn more about my professional education services for health professionals on my Continuing Education page.